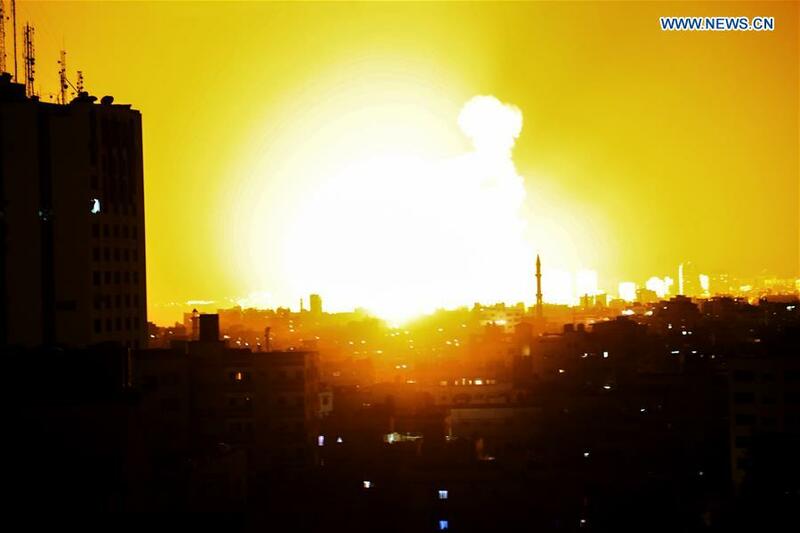 Israel on Wednesday carried out large-scale airstrikes in the Gaza Strip, targeting "12 terror sites," a military spokesperson said in a statement. Israel struck Hamas sites in Gaza, bombing a concrete factory and a maritime assault tunnel shaft, after at least 36 Gaza rockets hit Israel, the army said. The airstrikes came after an eight-rocket barrage hit the southern city of Sderot, lightly injuring at least six people, the Barzilai Hospital in Ashkelon said in a statement. Afterward, sirens continued to wail throughout southern Israel in the night, warning of more projectiles, as residents took shelter inside their homes. On Tuesday, two Hamas snipers were killed in Gaza in an Israeli artillery attack, which Israeli forces said was carried out under the misconception that Hamas had shot toward them. On Wednesday, the Israeli military raised the level of alert along the Gaza border. The military warned Hamas that it "will not tolerate any aggression against Israeli civilians or Israel Defense Forces soldiers, and is prepared for a wide variety of scenarios." The recent incidents are expected to distance the chances of a quick Egyptian-brokered cease-fire. Egypt has been taking efforts to achieve a deal between Israel and Hamas, the group that runs Gaza, but has yet to achieve an agreement between the two. The recent round of violence between Israel and the besieged Palestinian enclave has claimed the lives of at least 140 Palestinians and an Israeli soldier.